What Is a Drying Rack in a Dryer? Drying a pair of sneakers in your gas or electric dryer used to mean listening to a repetitive thumping sound for about an hour as your sneakers tumbled around the machine. With the advent of drying racks that fit inside the dryer, though, you can dry sneakers without the nuisance, as well as protect other items while they dry. Use a drying rack to protect your delicates. Although the specific sizes and installation vary by manufacturer, in general, drying racks are fitted racks that you can place inside your dryer to dry heavy or delicate items, such as shoes or sweaters. The rack keeps the items flat and secure as the tumbler rotates. 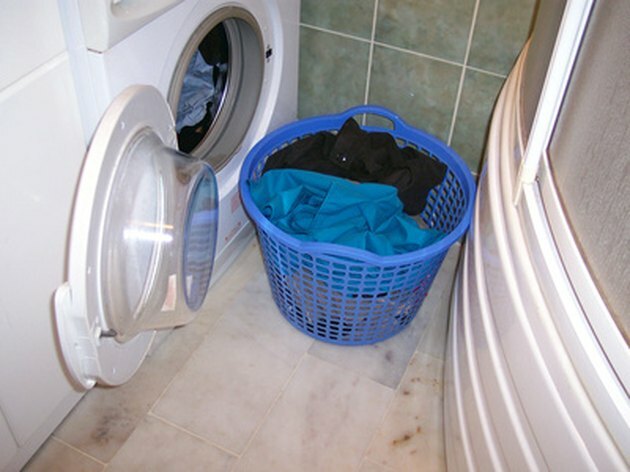 The items are dried by the heat of the dryer, without the noise or potential damage that tumble drying can cause. Racks usually are sold as an accessory to the dryer, although some models may include the rack with purchase. The primary benefit of using a rack in the dryer is to keep items from tumbling around and getting damaged. When you put a pair of shoes in the dryer, for example, the resulting thumping is loud, and after a while, a bit of a nuisance. Delicate items, such as sweaters, brassieres or other items with straps, can get tangled, twisted and misshapen when tumbled in the dryer with other items. Using a rack can prevent this from occurring and extend the life of your items. When you use a rack in your dryer, you still need to follow the care instructions for the item you're drying in terms of temperature and time. Always use a timed dryer cycle when using a dryer rack. Because the items on the rack are dried individually, they will likely dry faster than they would if they were tumble dried with other items. Carefully monitor the items drying on the rack in the dryer. Remove them as soon as they are dry. Don't allow them to overdry, which can cause shrinkage or other damage. Also, if your items have rubber or foam parts, such as on shoes, do not use heat as they could scorch or even catch on fire. If your dryer is equipped for a drying rack, or you purchase a compatible accessory, install the rack according to the manufacturer's instructions. Every dryer is different, but most have a predetermined space for installing the rack. Some hook over the link filter or fit into slots in the tumbler. Remove the rack from the dryer when it isn't in use.